Arnott and Vederoff Ancestors - Uncertain at this time what connection this is to Eva VanAnder, but headstone is in Antioch, Monroe County, Ohio. Taken August 2001. However, it may be sister to Eva VanAnders. The stone says Hannah Van Ander, Daugter of J.W. and E. an Ander. Died Oct " 1816, aged 10 years, 1 month and 19 days. Uncertain at this time what connection this is to Eva VanAnder, but headstone is in Antioch, Monroe County, Ohio. Taken August 2001. However, it may be sister to Eva VanAnders. 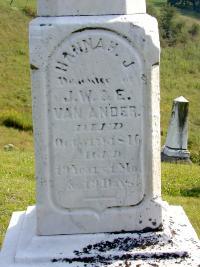 The stone says Hannah Van Ander, Daugter of J.W. and E. an Ander. Died Oct " 1816, aged 10 years, 1 month and 19 days.